Riedel Communications has expanded its portfolio as a solutions provider by becoming a certified manufacturer of Neutrik optical cables. Riedel Pure is the ideal fiber cable for installing MediorNet or MediorNet Compact at any mobile production. Based on Riedel‘s extensive experience in demanding rental projects such as Olympic Games, Formula 1 or the Eurovision Song Contest, Riedel designed a fiber optic cable that meets the highest demands in event and mobile productions. With Pure, clients directly benefit from Riedel's expertise. Riedel Pure is a very flexible, abrasion and chemical resistant PUR jacket fiber cable available in two ruggedized versions. Riedel Pure CS SM4 is a 5.7 mm tactical fiber cable exhibiting excellent impact and crush resistance while still remaining very flexible with low shape memory. The Riedel Pure XT SM4 is a dual jacket heavy-duty fiber cable with a diameter of 9 mm. 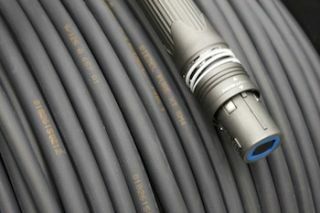 It is a metal free, heavy ruggedized and extremely strong tactile cable for extreme environments. Riedel Pure has a low bending radius meeting G.657A specifications for the most challenging mobile applications, including outside broadcast, touring, sporting venues and stadiums. The cable has no waterpeak and is fully CWDM applicable. All cables are available exclusively in single-mode fiber and can have either Neutrik OpticalCon Quad or Duo connectors. Individual components of the cables are produced by premium suppliers according to Riedel's specifications and assembled at Riedel's headquarters in Wuppertal.